I was really hoping the Astros would have signed Goldschmidt. It would have given them maybe the greatest MLB infield of all time. How many times in history has a single team won the World Series three times in a row? Perhaps the "old" Yankees or Dodgers, but none comes to my brain right now. My brain is kind of in a muddle. But that is okay. It could be in a puddle, which would not be very good at all. Messed up again! Back to being a newbie! Not only three, but five times in a row: the Yankees, under Casey Stengel, from 1949-53. It just figures the Yankees. Such a great team back then. Dang! 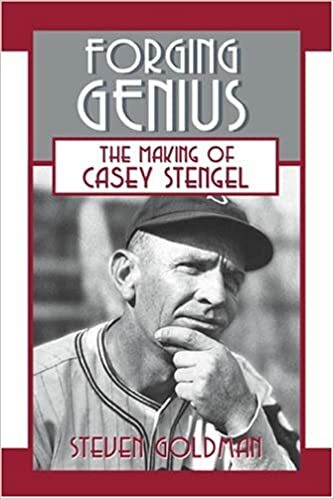 Casey Stengel. I have not heard his name in a long time! Mantle busted his gut laughing. "You played here?" he managed to ask through his laughing. A sportswriter happened to overhear the exchange, and Stengel tried to explain while holding his own laughter. "The boy never saw concrete before," the Ol' Perfesser said. "He thinks I was born sixty and started managin' right away." But it might shock some of today's fans who complain about some of today's game trends to realise Stengel was using those very things to win with the Yankees, including platoon splitting and even Moneyball-style baseball: Stengel was a big believer in and talker about on-base percentage decades before Billy Beane made a team-building science out of it; he thought nothing of going to his bullpen earlier than normal if he thought the situation called for it; he even paid attention to reverse platoon splits. (One of his most famous moves was based on just that: the purists screamed bloody murder when he brought in a non-descript righthander named Bob Kuzava to set down a rally in the final game of the 1952 World Series despite a group of lefthanded hitters due up for the Dodgers, but Stengel knew something the purists didn't: Kuzava at the time was better against lefthanded pitchers. And Kuzava saved the game and the Series, the fourth of the five straight Series Stengel won with the Yankees.) His basic managing philosophy: when you have an opening, shove with your shoulder. Stengel was a sabermetric kind of manager decades before anyone even thought of the term sabermetrics. And when he had the kind of players who could execute (his own favourite word) his kind of baseball, he won. He also managed the sad-sack Brooklyn Dodgers of the mid-1930s and the Boston Braves crossing into the early 40s. Where on both teams he could count on half a hand how many genuinely good players he had with those teams. He also had a rookie on the '42 Braves named Warren Spahn, who was still green enough that, when he refused to knock Dodger shortstop Pee Wee Reese down in a retaliation move, Stengel sent Spahn back to the minors. Stengel had one more round with Spahn, when the Mets acquired him from the Braves after the 1964 season. It gave Spahn one kind of bragging right: I played for Casey before and after he was a genius. Baseball news---Free-agent Indians relief pitcher Andrew Miller is said to be close to a new deal with the Cardinals. It's a good thing Anheuser Busch doesn't own the Cardinals anymore. They'd have one hell of a promotional headache on their hands with Cardinals fans holding up signs and wearing T-shirts saying "Now . . . it's Miller Time" . . .
@EasyAce What do you think of the Dodgers-Reds deal? Meanwhile, there are other teams trying other routes for 2019 . . . I'm at work and the company internet blocks sports pages. Who did the trolley Dodgers get in return? They got pitcher Homer Bailey (really a kind of reclamation project) and a pair of prospects, infielder Jeter Downs and pitcher Josiah Gray. In the 1930s, the Phillies weren't exactly barn burners, and while playing in old Baker Bowl an angry fan painted some graffiti on the large right field wall sign on which the team endorsed a certain deodorant soap. I tried to imagine here how that graffiti might have looked, since no photograph of it is known to have survived . . .
That was even funnier than the disgruntled Dodger fan of the same decade who painted the Ebbets Field occupancy law sign to read, "Occupancy by more than 35,000 unlawful and unlikely." Page created in 0.943 seconds with 21 queries.